The perfect gift for any occasion or time of the year. I understand that this card and the underlying funds do not expire. No fees will be imposed in connection with this card. For more information, please call temp-tations® Customer Service at 1-800-442-8671 or visit www.temp-tations.com/shop/giftcardinfo. Take the guesswork out of gifting with a temp-tations® Gift Card! 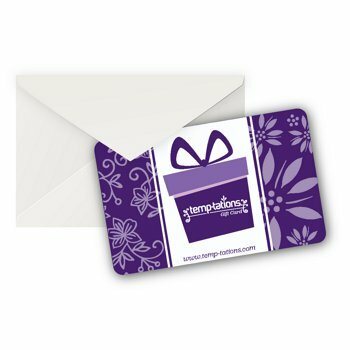 Choose from physical or digital Gift Card options in a range of denominations valid for any purchase on temp-tations.com. And shipping is FREE on Gift Cards! You can send a Gift Card in matching envelope directly to your recipient's doorstep, or combine it with your own order and receive it at your home so you can give it in person. Or, select a digital Gift Card and we'll send it to your recipient's email address instantly.